Stress, trauma, anxiety, and depression are experienced in the body. This is why it is imperative to work with the whole of who you are; body, mind, and spirit. Most of us learn to disregard the signals our bodies send us. Often this process starts at a young age as a way to survive and navigate our experiences. Disregarding the signals our body sends can become habitual until a symptom becomes bothersome enough for us to desire change. 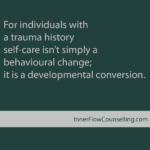 In body-centered counselling, we work to understand your unique nervous systems response to stress through a combination of talk therapy and mindful movement. This approach opens up a whole new level of understanding and acceptance about yourself from a place of compassion. Our sessions will unfold organically, ensuring you receive healing at the level and pace that most honours you in the here and now. You will learn practical tools to support you in your daily life allowing you to shift away from old patterns to experiencing life with trust, freedom, and satisfaction. As a Registered Master Therapeutic Counsellor and a Movement Teacher, I have been exploring holistic ways of healing for over 20 years. I have learned to trust my Inner Wisdom by learning about my unique nervous system which has allowed me to listen to the intelligence of my body, and in so doing, I have found my life’s passion, which is to support the healing of others. Visit the 'How I Work' page to learn more about my approach. Schedule a free 15 min. phone consultation (778.968.3196). Words cannot describe the pure joy to be experienced when we are truly free to express our innate Self and to live our lives authentically.